One of my favourite pastimes is browsing through books and vinyl in car boot sales, jumble sales and charity shops, so I was delighted today to come across a stack of vintage dance magazines in Haynes Lane Market in Crystal Palace, South London (still plenty left there in the book stall there if that's your thing too). 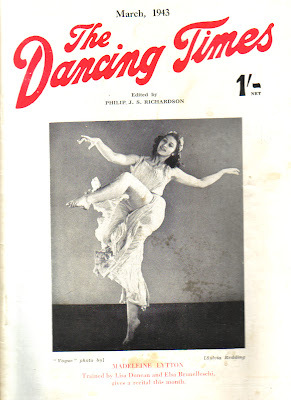 The English magazine 'The Dancing Times' was 'a review of dancing in its many phases' covering ballet, ballroom and other styles. The March 1943 issue (cover here) included various reviews and an article on dance films with the headline 'colour films have come to stay'. The adverts included ones for The Astoria and the Hammersmith Palais de Danse in London, two venues which have survived down to the present but which are both now under threat of closure. 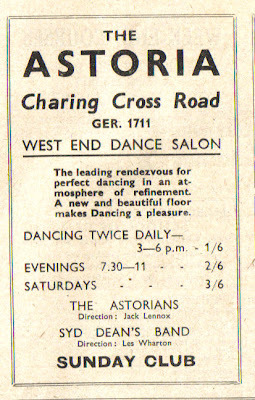 Both of these venues in 1943 (during the height of World War Two) offered dances every day at 3 pm as well as in the evening. This was a time of more or less full employment so who was dancing at this time of day - shiftworkers? I am fascinated by this daytime dancing culture, which seems to have continued down to the 1970s (Robert Elms mentions going to a lunchtime disco club, and the mod daytime scene in the 1960s was famously described as The Noonday Underground by Tom Wolfe). Who has time to go out clubbing at lunchtime now if they're working, and even if they did where would they go? This is surely due a revival!